Amatrol’s DC Generators Learning System (85-MT2B) teaches industry-relevant DC generator skills including how to: operate, install, analyze performance, and select generators for various applications. A generator is a device that creates DC electricity and can be found in diesel locomotives, as well as aircraft and marine systems. The DC generators training system requires Electric Machines (85-MT2) and electricity (208 VAC/60 Hz/3 phase). 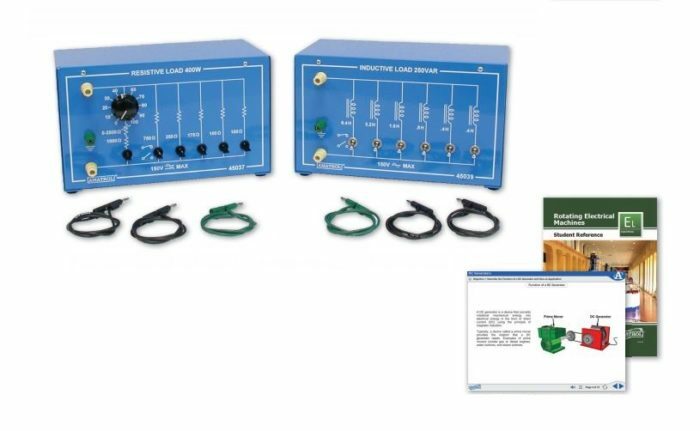 This industrial motor training system includes resistive load and inductive load units that connect to the DC generator supplied with the electric machines system (85-MT2) to provide operation under various types of loads. Learners will use these components to study topics such as DC series generators, DC shunt generators, and DC compound generators. Amatrol learning systems feature a perfect combination of theoretical knowledge and hands-on skill building to reinforce each in a learner’s mind and strengthen comprehension for more advanced skills. The DC generators training system includes a resistive load unit with six parallel branches of resistance and a total resistance of 33 ohms – 3500 ohms, an inductive load unit with six parallel branches of resistance, and a lead set. These components will be used to practice a variety of hands-on skills including determining the brush polarity of a DC generator using a digital multimeter; connecting and operating a DC series generator; connecting and operating a self-excited DC shunt generator; and connecting and operating a DC compound generator. This system includes world-class curriculum that begins with a basic introduction to DC generator concepts and then explains the operation and performance of three types of DC generators. Specifically learners will study objectives like: defining brush polarity and armature reaction; learning two wiring configurations for DC shunt generators; and understanding the performance characteristics of a DC compound generator. This curriculum is presented in a highly-interactive multimedia format that engages all learning styles. This multimedia features stunning 3D graphics and videos, audio voiceovers of all of the text, and interactive activities and quizzes. DC generators is just one option for electrical machine training from Amatrol. Other options to add onto the basic electrical machines training (85-MT2) include Alternators / Synchronous Motors (85-MT2C) and Wound Rotor Motor (85-MT2D). Alternators and synchronous motors training includes capacitive load, combination synchronous motor/alternator, and synchronizing lights/switch unit to cover topics like alternator output voltage and frequency, three dark synchronization method, and reversing a synchronous motor. The wound rotor motors training includes a wound rotor controller and motor to cover topics such as speed controllers, motor reversing, and performance analysis and measurement. A sample copy of the Rotating Electrical Machines Student Reference Guide is included with this learning system. Sourced from the system’s curriculum, the Student Reference Guide takes the entire series’ technical content contained in the learning objectives and combines them into one perfectly-bound book. Student Reference Guides supplement this course by providing a condensed, inexpensive reference tool that learners will find invaluable once they finish their training making it the perfect course takeaway.